According to the Medical Examiner’s Office, there are five deaths related to Hurricane Irma in Orange County. One was due to blunt force injuries – a driver was involved in unwitnessed collision – and one death due to electrocution because of contact with a downed power line. Three are due to carbon monoxide intoxication by inhaled generator exhaust. Carbon monoxide is odorless and kills. Do NOT use a generator in your home, garage or business. Others included in the Declaration consist of Brevard, Broward, Charlotte, Citrus, Clay, Collier, DeSoto, Duval, Flagler, Glades, Hardee, Hendry, Hernando, Highlands, Hillsborough, Indian River, Lake, Lee, Manatee, Marion, Martin, Miami-Dade, Monroe, Okeechobee, Osceola, Palm Beach, Pasco, Pinellas, Polk, Putnam, Sarasota, Seminole, St. Johns, St. Lucie, Sumter and Volusia counties. On Friday Sept 7, 2017, Mayor Jacobs issued Emergency Executive Order #17-09, declaring a local state of emergency. This order allowed us to prepare for threats associated with Hurricane Irma. Mayor Jacobs extended that order for 10 additional days. This extension will allow Orange County to continue to access emergency resources necessary for the health, safety and welfare of our residents, guests and businesses and to recover from Hurricane Irma. Curbside debris removal has already started in Orange County. However, the volume of yard debris throughout the county is very large, so please keep in mind that it may be several days before a debris team arrives in your community. It is the county’s intent to serve the community in a well-organized manner. For more information, visit www.ocfl.net/debris. Vegetative storm debris including tree limbs, branches, and other organic debris should always be separated from storm-related construction debris shingles, fencing, lumber, drywall, etc. Mixed debris will not be accepted at Drop-Off Sites, and for curbside removal, construction debris will be collected separately, and if not separated, neither may be picked up. Also, household garbage should NEVER be mixed with storm or construction debris. County contractors cannot enter private gated communities for debris removal, except in cases of critical life/safety emergencies. For gated communities, an authorized community representative should contact 311 to arrange for permission for the community’s contractor to drop off debris at a designated Citizen Drop-Off Site. 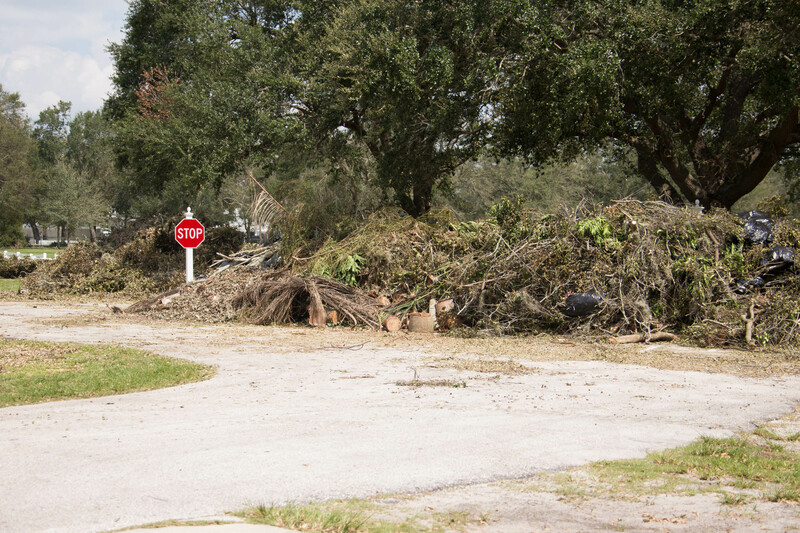 Alternately, the community representative can arrange for a County debris contractor to meet the community’s contractor at or near the entrance to the gated community, to accept debris. Debris will only be removed from private property in the case of severe damage, per the Federal Emergency Management Agency (FEMA) policy. If the debris is an immediate threat to residents, State or local government may enter private property to remove debris to eliminate threats to life, public health and safety. Visit www.ocfl.net/debris for more information. Orange County has 10 debris sites open with a lot of activity. Hurricane relates debris includes tree limbs and vegetation, not furniture, old TV sets and construction debris like fences. Burning debris during recovery is not permitted. All curbside collection services have been moved back by one day this week for unincorporated Orange County customers. Friday customers should set out carts for collection on Saturday. This is for garbage, recycling and regular set out limits of yard waste (three cubic yards -the size of a small pickup truck). Yard waste may be collected in limited quantities until the volume is reduced throughout the affected area. Storm debris that does not meet the curbside yard waste collection guidelines will not be collected by the residential curbside collection service. Larger storm debris will be picked up by debris removal contractors beginning today. Please be patient during this recovery. Orange County continues to ask residents to conserve water. The storm placed a considerable strain on our wastewater pump stations, but progress is being made. Please reduce toilet flushing, and running washing machines and dishwashers. Please don’t take long showers. Out of nearly Orange County traffic signals operated by Orange County, 20 do not have power and 5 are flashing. Orange County is working with Orange County Sheriff’s Office to provide safe passage at traffic signals and at crossing guard stations when schools become operational again. Public Works continues to clear the roads. However, 15 roadway locations still have partial blockage trees/lines down, but drivers are still able to make passage. Trees and debris may continue to fall. Call 311 if you see a down tree in a roadway.